The two day workshop “Prizren City Branding” was held on the 7th and 8th of December 2017 in the old Town Hall building (Beledije) in Prizren. The workshop presented concepts for city branding, held inclusive discussions on the elements for branding the city of Prizren, as well as helped draft the branding action plan for the Historic Center Management Plan of Prizren. This workshop was organized by Autostrada Biennale (AB) and the Network of Cultural Organizations (RrOK) of Prizren, funded through CHwB Kosovo and the Ministry of Culture, Youth and Sports. This chapter deals with the workshop in Prizren, which gathered many participants to discuss the opportunity and need for branding Prizren, its importance and how to organize such an undertaking if it takes place. The program and fundamental concepts of branding were presented on the first day of the workshop. Leutrim Fishekqiku from AB and Enes Toska from RrOK Prizren led the presentation on the purpose of the project, and the need to brand Prizren both as a historical zone, as well as a cultural heritage landmark with historic and contemporary values alike. To further develop the branding concept, Eliza Hoxha discussed branding as a product and as a process within different layers and contexts. She further discussed the difference between branding and marketing, and where one should be careful in understanding the trustworthiness of a brand and how to attain a proper representation. We discussed different levels of branding, beginning with the branding of public space, city, nation, and region. Later, the workshop focused on the factors that influence branding – the strong ones that deal with infrastructure and services, as well as the soft factors with their emotional aspect, and the sense of belonging and identity with the place. Another important factor is the matter of managing the resources that create a brand, as well as increase the representation and identification with the place. Nora Arapi further presented the values which have determined the vision and objectives for the development and management of Prizren’s historical zone. 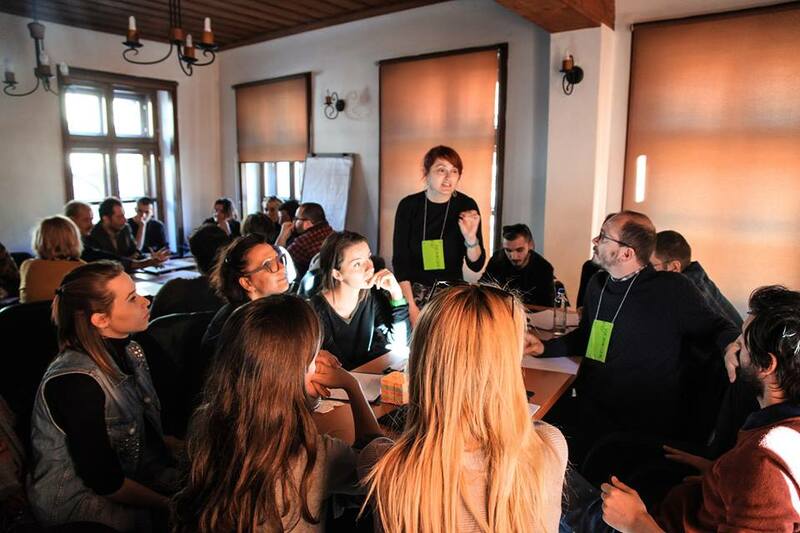 The group work component of the workshop aimed to bring about as many ideas on the material and immaterial values which distinguish the city of Prizren and its surroundings. Jeton Jagxhiu led the group dealing with the immaterial aspects, while Yll Rugova’s group dealt with the city’s tangible elements. 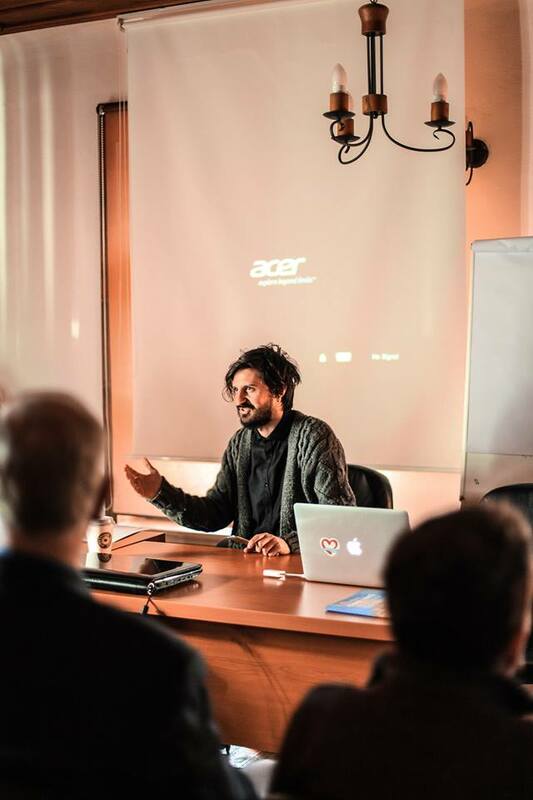 The second day began with Tahar Almedar’s VR rooms presentation, which included a simulation of how Prizren might be branded with the keyword that best distinguishes the city such as #prizrening, and featuring its inner and outer determining factors. By this time, the first days’ discussions had already taken shape as a potential product for the branding of the city. Berin Hasi then went into the details of the representative elements of design and their use in documents, emblems and other identifying elements of the city. The roundup of the entire discussion was made with a skype call from international expert Rand Eppich, who shared his views of Prizren by comparing it with cases of different cities and who further emphasized many things that had previously been discussed in the workshop. It was fascinating to see him drawing parallels with the discussions of the local group with whom he had no previous interaction. The primary purpose of branding is to identify the potential of the city and to highlight its importance for the local community and targeted visitors. The brand must be credible, measurable and tangible in order to enhance Prizren’s unique identifying elements in relation to other cities in the region and beyond. So in the case of Prizren: what would be the main specifics of its branding process? In terms of the spatial aspect, there are three layers upon which we could create the narrative / brand for Prizren: 1. The Historical Zone, 2. The City / Municipality and 3. The Region of Prizren. This can constitute all the layered physical and environmental characteristics of the zone, such as the highlands (mountain landscape), the role of water in shaping the city, the windmills, springs, as well as the cult of the Mother of Water. Furthermore, we can include other physical elements such as the Prizren Fortress, the cultural objects and many houses which over time have created the layered urban landscape we see today. On the other hand, another important element is the spiritual heritage and collective memory of the citizens, as Prizren represents religious harmony, coexistence and tolerance. Other “soft” elements such as music (Zambaku i Prizrenit), clothing (especially tanning) and specific cuisine (lamb, sharr mountain cheese, hashlama) play an important part as well. Beyond the powerful inherited identifying elements, the city brand may also be built upon new elements that have begun to leave a mark and that put Prizren on the very important map of global communication, such as the first Biennale of Contemporary Art in Kosovo and the only one of its kind in the region – Autostrada Biennale. From this vast assortment of signifiers over time, which could be the primary attributes that dominate Prizren’s brand, and which may be assessed to be its supporting elements? This also depends on our approach of either branding the city for its citizens, by pointing to the shaping and growth of its collective pride, or branding it for a wider audience by basing it on the principles of cultural tourism and what Prizren can offer within its urban area and in the region as a whole. This is the first workshop to open a public debate on the importance of branding Prizren, and one where the final report on its outcomes was attached to the Plan for Managing the Historical Center of Prizren.